From Notice: “Grand Bend Wind Limited Partnership c/o Northland Power Inc. is planning to engage in a renewable energy Project in respect of which the issuance of a renewable energy approval is required. 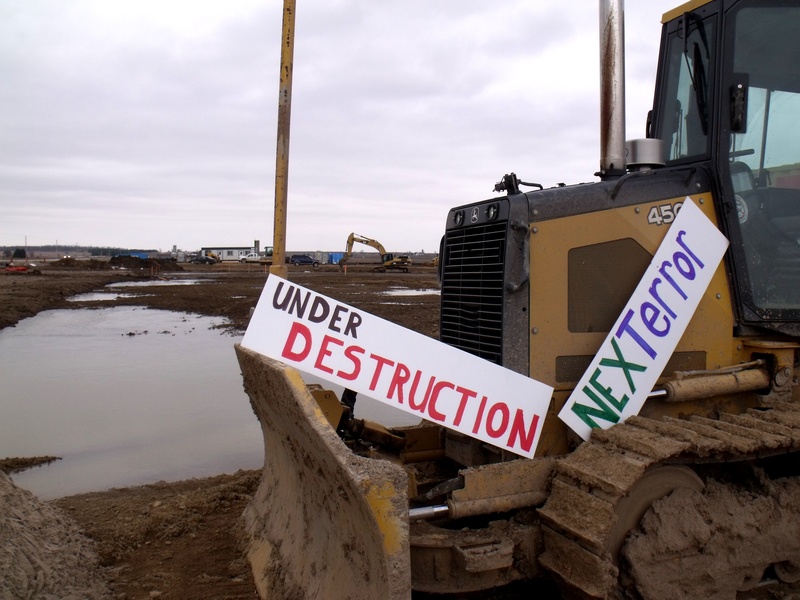 The distribution of this Notice of Draft Site Plan (“Notice”) is subject to the provisions of the Environmental Protection Act (“Act”) Part V.0.1 and Ontario Regulation 359/09 (“Regulation”). This notice is being distributed in accordance with Section 15 of the Regulation prior to an application being submitted and assessed for completeness by the Ministry of the Environment. 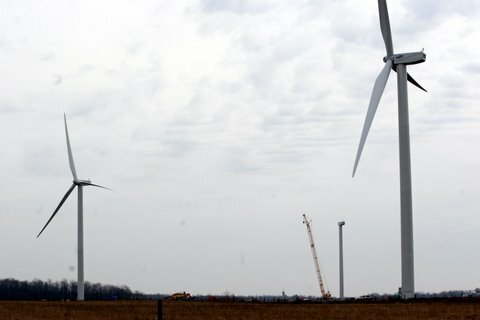 The legal effect of this Notice is such that pursuant to Section 54 of the Regulation, Grand Bend Wind Limited Partnership has to take into account noise receptors as defined by the Act that only existed as of the day before Grand Bend Wind Limited Partnership published this Notice. 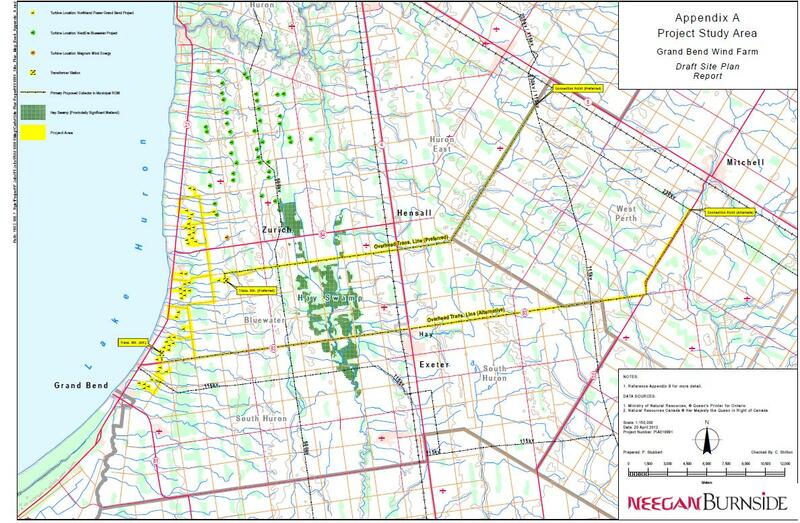 If you take a look at the NextEra map for the 63 wind turbine “Goshen Wind” project, you wouldn’t even think the turbines would be larger than a pin head. And conveniently the dots are green…. the same colour as the background. So I helped the company out and put some colourful turbines in myself – I know, they shhould pay me. 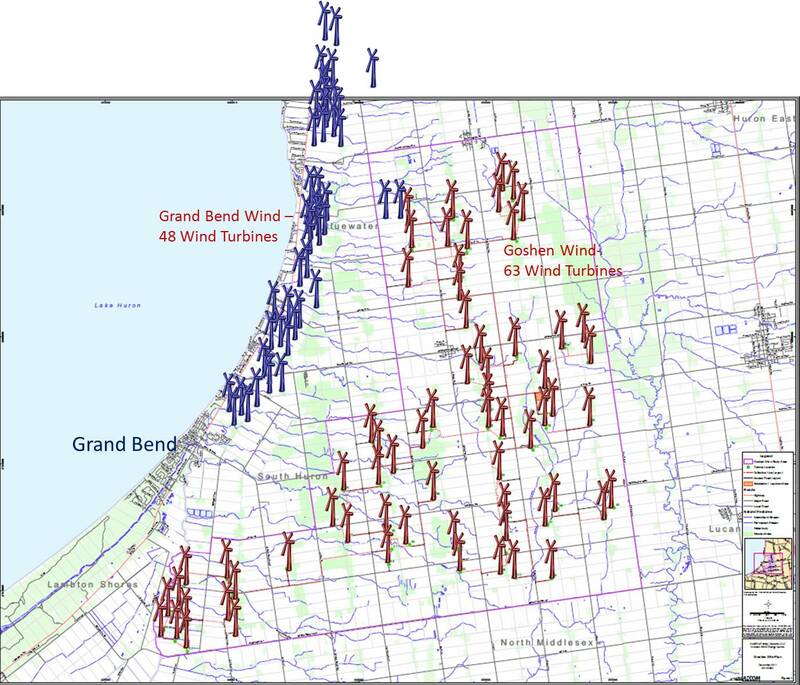 While I was at it, I thought you might also like to see the 48 “Grand Bend Wind” turbines that are proposed by Northland Power. Cottagers, while you were worried about the turbines in the lake, these monsters were creeping up behind you on land.